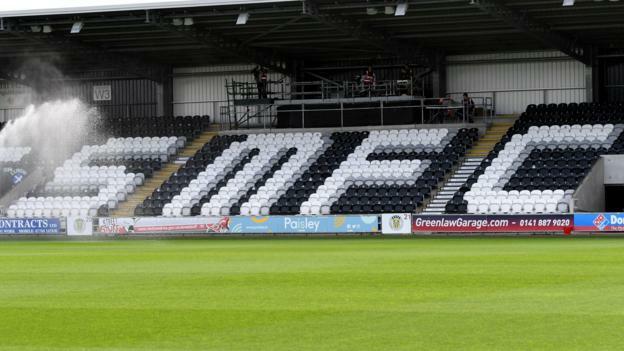 St Mirren have condemned the “utterly unacceptable” actions of home fans who allegedly spat and threw coins at an unconscious Dundee United supporter. The club say the fan suffered a serious head injury after supporters surged forward at the visiting side’s first goal in Saturday’s Scottish Cup tie. St Mirren add “numerous people decided to spit and throw coins at him”. “We cannot allow the actions of a very small number of fans to ruin the reputation of St Mirren,” they stated. The Paisley side have asked supporters to help indentify those involved, saying that the quality of the CCTV footage of the incident is not sufficient to “pursue this to the degree of certainty that would allow prosecution”. The club add that should they “clearly identify the culprits”, they will be given a lifetime ban from the Simple Digital Arena. Dundee United won the game 2-1 to reach the Scottish Cup quarter-final. St Mirren say the police “have been in dialogue with us over some incidents and behaviour that has taken place predominantly at away games”. “This relates to a very small number of fans, however, it goes without saying that this negatively affects the reputation of the support as a whole,” they added.